BRYAN EATON/Staff photo. 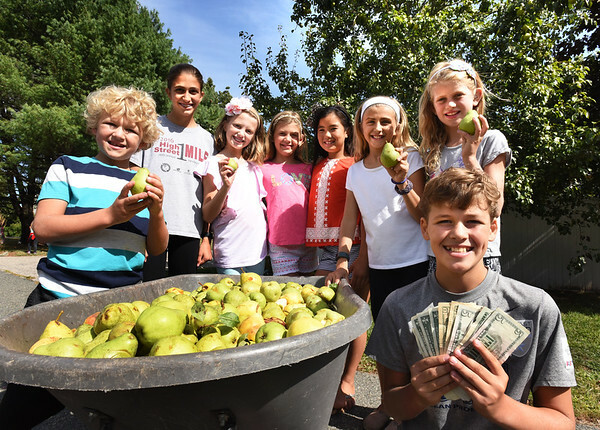 Friends and siblings in the "Squires Glen Neighborhood" which is off Hale Street in Newburyport, gathered Bartlett pears from the bountiful tree behind them to sell and raise money for victims of Tropical Storm Harvey. Still deciding which venue to send the $200 raised, are, from left, William Cotter, 8, Hailey LaRosa, 12, Madeline Bell, 10, Charlotte Cotter, 10, Avery Tahnk, 10, Maya LaRosa, 10, Emma McIsaac, 10, and Ben Cotter, 12.